It’s no secret that today’s customers are looking for a better in-store shopping experience. While 64% of Americans still prefer shopping in brick-and-mortar stores, most shoppers agree that there’s room for improvement in stores. According to the new American Customer Satisfaction Index (ACSI) Retail Report, customer satisfaction with department stores dropped 1.3% last year, to an updated score of 77. One sub-vertical where retailers are already improving is grocery. The ACSI report revealed that customer satisfaction with supermarkets actually rose 1.3% in the past year, as food retailers have made the changes that customers want – higher quality products, more variety, and overall improved customer service. Running engaging demos is one way grocery stores – and brands within stores – are successfully delivering an impactful customer experience. For example, one national beverage brand recently found that demos hosted by brand-immersed field agents and focused on customer engagement yielded a positive long-term effect on product sales. 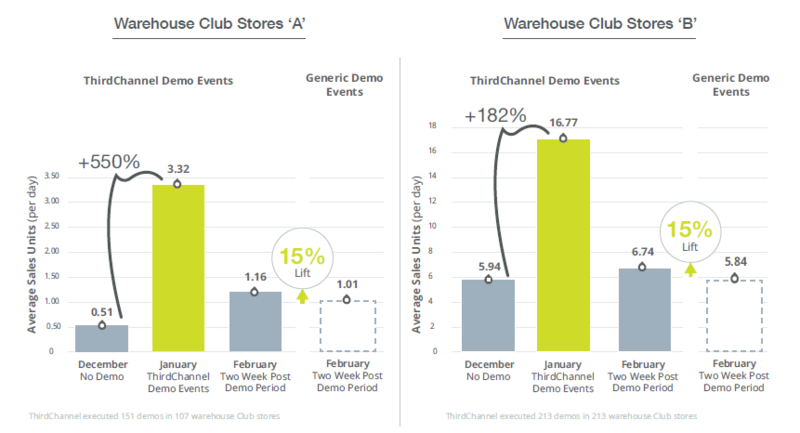 The brand leveraged ThirdChannel’s demoing and assisted selling solution to set up well-branded demos hosted by knowledgeable, enthusiastic brand representatives in more than 300 warehouse club stores. Throughout 364 demo events, ThirdChannel agents engaged a whopping 48,372 consumers and distributed 36,118 samples. The demo period was a success, yielding a significant sales lift compared with the previous month’s sales. And, 5,149 engaged consumers indicated intent to purchase the product, which is a 10.64% conversion rate. Colorful, branded table-top demos proved to be an effective way to attract shoppers’ attention, especially when it came to shoppers who hadn’t ever bought the product. That’s exactly what happened during this demo: 72% of customers with intent to purchase were first-time buyers. Gaining new customers helps grow market share, retain market position and expand the business in general. For this brand, the benefits didn’t end when the demos did. They enjoyed an initial sales lift, but also saw meaningful residual sales and improvement in long-term customer value. Though sales dropped off a bit immediately after the demo ended, sales from stores hosting ThirdChannel demo events continued to be higher than before the demo. The key to this lasting success? Customer engagement and experience. Customers who interacted with the branded demo formed a better, lasting impression of the brand because of their interaction with knowledgeable, enthusiastic brand reps. Perhaps the reps explained the health benefits of the product in great detail, or their enthusiasm for the beverage was simply infectious. Either way, those customers were more likely to come back and purchase the product, even after the demo had ended. ThirdChannel’s data insights on where to set up demos in-store, which stores to demo in and what days and times to demo, helped maximize ROI. Ground data and business intelligence enable brands to create authentic on-brand experiences, designed to attract new customers and retain existing ones.